Roney Palace Condominium Association, Inc. 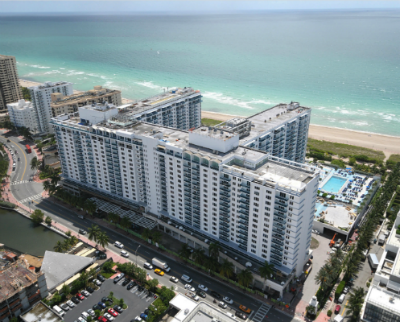 The Roney Palace Condominium is an 18-story mid-rise located at 2301 Collins Avenue in Miami Beach Florida, on the Atlantic Ocean. The original Roney Palace was built by Newton Roney and opened in 1926 (designed by the same architect as the Waldorf in New York City, Florida's Breakers in Palm Beach and the Biltmore in Coral Gables). Rich in history and fame, guests included the Duke and Duchess of Windsor, Orson Welles, and Rita Hayworth. Desi Arnaz often performed and radio personality Walter Winchell did many of his famous broadcasts from the Roney's world famous Bamboo Room. Roney Plaza was the first hotel on Miami Beach to offer cabanas, tennis and a golf course. In 1968 the Franklin Brother Construction Group purchased the Roney Plaza. They demolished and re-built a new Roney Plaza, which opened in 1971 and was home to the famed 30,000 square foot Roney Pub. Today, the property has retained its historical name and has undergone a major renovation that included new balconies and new windows. This historic property is also home to the 1Hotel and is ideally located on the quiet edge of South Beach, just steps from the beach, Atlantic ocean, Miami City Ballet, Bass Museum of Art, Miami Beach Library, Jackie Gleason Theater, Lincoln Road and Ocean Drive. The property features 600 feet of beachfront, 4 pools on huge separate decks and valet parking for over 1,000 cars. Condo rental units are available with a one month minimum.